Pet Emergency? Call us right away at (757) 595-3337! At Warwick Animal Hospital, our goal is to provide the highest quality preventive, geriatric, dental, medical, and surgical care available for your pet. We provide care for companion dogs and cats, as well as exotic pets, including "pocket pets" (hamsters, gerbils, guinea pigs, ferrets, etc. ), reptiles, and amphibians. We provide limited services for birds. Warwick Animal Hospital is proud to have the highest level of accreditation available from the prestigious American Animal Hospital Association and has been an AAHA accredited hospital for 57 years. We are also members of a variety of other professional organizations, including the American Veterinary Medical Association, the Virginia Veterinary Medical Association, and the Greater Peninsula Veterinary Medical Association. 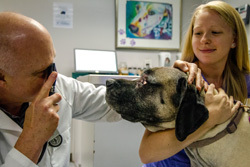 Warwick Animal Hospital provides high-tech special services for our clients, such as laser surgery (we were the first veterinary hospital in the United States to offer laser surgery for pets), therapy laser treatments for arthritic pain, and digital radiography. Further information is available under Services. At Warwick Animal Hospital, we treat your pets like the valued family members they are. "Everyone went so far out of the way to help my sick dog. Cant say enough good things." "t was a nice visit, was greeted pleasantly by the receptionist ,the techs treated me and Nathanial with respect and love for my pup, the Dr. Gustafson was very tentative and truthful, about Nathanial's health...its a great place to take your loving pets for wonderful care......."